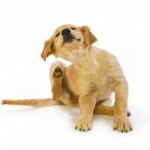 Is Fido suffering from fleas or bed bugs? Posted byManuel Villanueva December 13, 2010 October 5, 2015 1 Comment on Is Fido suffering from fleas or bed bugs? Most likely, if Fido is being bit by bedbugs then so are you. Bedbugs feed off of humans although all mammals and birds can be targets. Transients such as homeless people are the source of bedbugs. Do bed bugs live on pets? No. They live inside your home where they hide in cracks and crevices. They may also hide under your pet’s bed. Is Frontline or Advantage effective for treating bedbugs? No. Use only products specifically formulated for bedbug treatment. As far as pet products, a quick search of Foster & Smith and Petedge turned up nothing. Can I test my home for bedbugs? Yes. There are commercially available products (Climbup Insect Interceptor) on Amazon that can test your home for bedbugs. Host (i.e. pet, human) has bites usually along the trunk. Sometimes there is a pattern of 3 bites in a row. Bedbugs have trouble moving through pet hair so look for bites on the belly and groin where hair is sparse. Areas with bedbugs have a sickly sweet smell (i.e. motel room). For more information on bedbugs and your pets see the AVMA FAQ page. Can bed bugs bite my pet?